Kris Norris shows you his favorite warm-up exercises. These exercises will prepare you to play the guitar from a physical and mental standpoint. In this lesson, you will learn Kris' "Egyptian Warm-up", along with his legato and economy picking warm-ups. Chapter 1: (00:43) Introduction Welcome back to the Phase 2 Artist Series with Kris Norris! 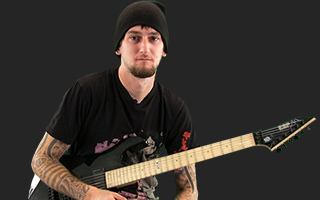 Kris kicks off this lesson with some shredding licks in the key of E minor. In this lesson and many more lessons to come, Kris will present several exercises that will help improve your technique and enable you to play at faster tempos. Note: Kris' guitar is tuned down one full step. Consequently, the introduction music sounds as though it is played in the key of D minor. Chapter 2: (04:07) Egyptian Warm-up Exercise This exercise is mainly comprised of notes from the fifth mode of the C harmonic minor scale. This Eastern sounding tonality has a G root note. In the context of the exercise, a chromatic note F# note is also added to the scale. For the purpose of this exercise, all notes will be played on the third string. This will enable you to pull-off from any fretted note back to the tonic note of the scale. Note: Kris has indicated which notes should be used in this exercise under the "Supplemental Content" tab. This component of the exercise is designed specifically to be a left hand warm-up. At this point, you don't even need to use the right hand. Using the tonality listed above, improvise pull-off licks on the third string. Pull off from any note in the scale to the open G string. Strive to create meaningful melody lines. This exercise is as much of a musical exercise as it is a technical exercise. Consequently, it should be practiced as a piece of music. It must be played in strict rhythm. Begin at a slow tempo and gradually work your way towards higher speeds. Next, add the right hand into the exercise. Pick each note before pulling off to the open G string. Slowly begin to interject more picked notes in between pull-offs to the open string. This time, pick every note in the exercise. Begin the exercise with slower rhythms such as quarter notes, eighth notes, etc. Then, begin to incorporate sextuplets and sixteenth notes into the mix. Do not play fast rhythms for extended periods of time. Use techniques such as rapid slurs during a brief "sprinting" period. Then, return to slower rhythms. Add tremolo picking to the previous step. Combine all of the elements and improvise your own melodies using this scale. Kris demonstrates this idea at the end of the scene. Legato is defined as a melodic style in which melody notes are played smoothly with no separation between them. On the guitar, a legato style can be achieved by performing multiple hammer-ons, pull-offs, and slides on a single string. Since not every note is picked or articulated, a smooth, flowing sound is produced. This legato exercise features multiple slurs played within the tenth position pattern of the D Dorian mode. In the second measure, the scale descends to the ninth position pattern of this mode. Now, the first finger must perform an out of position finger stretch to play the notes at the 8th fret. As the exercise continues to descend to lower positions of the D Dorian mode, it repeats the same sequence of slurs. Once the lowest position in the exercise is reached, the exercise ascends a position at a time until the starting point is reached. Practice each position within the exercise individually. Then, begin to string the entire exercise together. Always play legato exercises in time with a metronome to ensure that your slurs remain even. Every note under the slur line must receive the exact same rhythmic value. Be careful that you do not cut the first note short within a slur figure. Chapter 4: (03:38) Economy Picking Warm-up In this exercise, alternate picking is applied when notes are played on a single string. When a string crossing occurs, the pick continues in the same direction. For example, two consecutive downstrokes occur when moving from the fifth string to the fourth string. When descending from the fourth string to the fifth string, two consecutive upstrokes must be used. This technique allows you to pick with maximum speed since no movement is wasted. -Practice this exercise with all adjacent string pairs within the scale. -Practice the exercise with a wide variety of scale patterns. For example, Kris demonstrates the exercise with the C Lydian mode. This mode features a raised fourth scale degree. In comparison with C major, C Lydian features an F# instead of an F natural. Chapter 5: (00:44) Final Thoughts The warm-up exercises presented in this lesson cover a wide musical base. These exercises blend technical as well as musical practice. Consequently, they will improve your playing in the most efficient manner possible. Due to the musicality aspects of the exercise, it will take much longer for you to tire of them. When practicing technique, it is very important not to follow into a routine of going through the motions. In order to improve, your focus must remain intact. Exercises that engage your creative side will always hold your attention span longer. If you have any questions pertaining to this lesson, feel free to contact Kris on JamPlay. You may leave questions in the "Comments" section of this lesson or on Kris' discussion forum. You can also send him an email directly on JamPlay. Using a non-standard tuning in this teaching context is completely unnecessary and complicates the student experience considerably. Retuning your guitar vs making every student retune theirs, or have to go through transposing, physically and/or mentally. This really helped me playing the C Major scale in other ways than just up and down the neck in the same position! Thanks Alot! Dude, it seriously looks like the video is being fast forwarded when you play really fast, lol. It's insane. what are the benefits of economy picking? Can you please put the tabs for this lesson? Really cool! I like your teaching style, hope to see you in future lessons. Very impressive! I've started playing around with this, and it is really helping the two-hand coordination. That warmup is NASTY!!!! can't wait for future videos! This is pretty awesome, looking forward to your future lessons. this will keep me busy for a while thanks man!! Kriss, nicely done, and really insightful. i know that will give me some new patterns and ideas to warm up with! mine were getting quite stale!!! thanks so much for bringing that lesson to everyone!!! your skills are truely sick man!!! awesome!! !